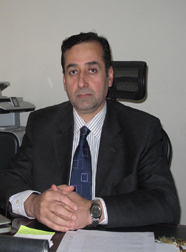 Hassam has more than 20 years of total experience in the Management of Telecom and IT Sectors of Afghanistan. He has worked in the Telecom Services Department of the Ministry of Communications and IT of Afghanistan from 1990 to 1994. Thereafter, he undertook Senior Management Position in the Office of His Excellency President of the Country, where he worked as a Member and also as Chief of the President’s Office from 1994 to 2001. After having a successful tenure of 07 years in the Office of the President of the country, he was appointed as Deputy Minister-Technical of the Government in the Ministry of Communications and IT of the Government of Afghanistan in Dec. 2001. For the last 10 years (from 2001 till date), he has been working as Deputy Minister-Technical of MCIT, where he has been managing all the Telecom and IT Projects of the Country. In MCIT, he has been holding the topmost management positions like Chairman of the Technical Board and the Chairman of the Project Implementation Coordination Unit. As Deputy Minister-Technical of MCIT, he has been dealing with Technical Management related activities of all the Telecom and IT Projects funded by the World Bank, USAID, ADB and many other leading Donors since 2002. Hassam has played a leading role in revolutionizing Telecommunications in Afghanistan, where the Telecom density has grown from 5 % to 70 % during last 10 years. - Member of Media High Council. Beside his current job in MCIT, he is researching in the Development Studies for Masters (MBALS) at University of Cambria & Robert Kennedy College, the UK.